This is a perfect time to be in Buffalo, New York. The blast furnace heat and humidity are gone and the blizzards have yet to arrive. We have had great weather in upstate New York and it extends as far west as Buffalo. The city is having its share of golden afternoons, complete with red, orange and gold fall foliage. One of the neatest parts of Buffalo is Allen Town, the Arts District. One of the neatest eateries in the Arts District is Founding Fathers Pub on Edward Street, near the intersection with Delaware Avenue. 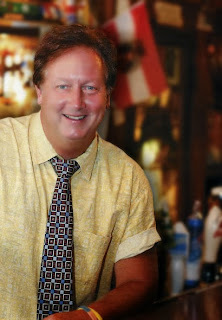 Michael Driscoll, owner of the pub, is a retired social studies teacher, who tended bar in college. Driscoll brings his love of history, politics and geography - - and his bartender’s congeniality - - to this appealing pub in a historic building that was a livery in the nineteenth century. Fittingly, the place opened on Election Day, 1985. 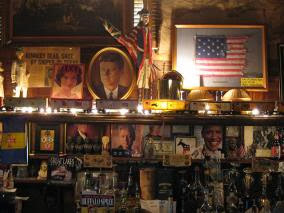 Inside, the walls are covered with historical memorabilia and flags. It appears every President is represented with a portrait or photograph. Driscoll explained that he gets some of the flags when he travels but many people bring in flags from far flung places, to add to the atmosphere. Driscoll, his bartenders, waiters and waitresses are welcoming, as are the patrons. Early in the evening, people stop for a drink or dinner. Later on, college students come in. Both groups seem to co-exist, smoothly, and the place is pleasantly lively. The menu is reasonably priced, tasty and has fun items. Free nachos and popcorn are available. One of the appetizers is ground chicken meatballs, made with a local brand of Buffalo sausage and coated with Buffalo chicken wing sauce. Founding Fathers has a few pasta dishes and a delicious variety of burgers and hot and cold sandwiches. Both menu and website talk up a fried bologna sandwich, but I am not yet adventurous enough to order it. Daily specials are noted on blackboards in the dining room and in the bar. A high point at Founding Fathers is the monthly trivia game that Driscoll hosts on the first Tuesday of each month. If you cannot attend the trivia game and are sitting at the bar, Driscoll may toss off a trivia question or two. On a recent visit, he asked which President was born in Illinois - - and it was not Lincoln or Obama! For patrons who want more history, take time to walk in the neighborhood. On the corner of Edward and Delaware is the Mansion Hotel, a full service hotel in an old mansion. A few steps away to the east, on Franklin Street, is a pavement-busting sycamore said to be the oldest tree in Buffalo. Around the corner and north on Delaware is the Theodore Roosevelt Inaugural Historic Site. A short drive to the north is the Albright-Knox Art Museum, which was collecting and showing Picasso’s work at least a decade before the Museum of Modern Art in New York City was even formed! 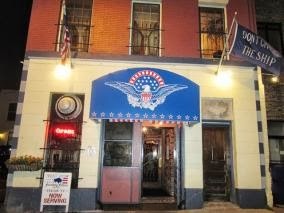 If you can’t visit Founding Fathers Pub, or cannot return soon enough, please visit their website. It has a cartoon of George Washington crossing a river, possibly the Niagara River, on a burger, great writing, pictures and the menu.